The first Round Table was formed in Norwich, England in 1927. The founder, Louis Marchesi, was a young member of Norwich Rotary Club who felt there was a need for a club aimed more at the younger businessmen of the town. His vision was for them to exchange ideas, learn from the experiences of their colleagues, and together contribute to the civic life of the town. From the beginning, the Round Table was a non-religious, non-political, and non-sectarian club, an ethos that still underpins the movement today. The second Round Table club opened soon after in Portsmouth and then the idea really took off—by the time the Second World War broke out in 1939 there were 125 clubs and 4,600 members. The first overseas group was formed in Copenhagen in 1936, and while the movement continued to grow in Denmark, the war years halted British expansion for a while. The existing clubs held strong, however, and when the war was over the momentum grew once again as clubs were chartered all over Britain. Today, in the United Kingdom, there are 600 local Round Tables, with a combined membership of close to 8,000. It was a Rotarian who launched Round Table in South Africa. Dr. David Smith had been a Round Tabler in Bath, England, but after the war he settled in East London and joined the local Rotary Club. As Chairman of the Club’s Youth Service Committee he received in 1948 a letter from the International Extension Officer of Round Table of Great Britain and Ireland (RTBI). The letter sought the support of Rotary for the extension of Round Table into Southern Africa, but although David Smith was himself immediately fired with enthusiasm Rotary did not at first give its official backing to the idea. David was himself below the 40 year age barrier and his vigor and enthusiasm were reflected in the first East London Table established in November 1948. They immediately tackled an enormous project – the collection over a three-year period of a sum of R36000 for the building in East London of a tuberculosis settlement. Within two years this figure was exceeded, and Round Table very quickly made its mark as a dynamic force in the sphere of community service in Southern Africa. 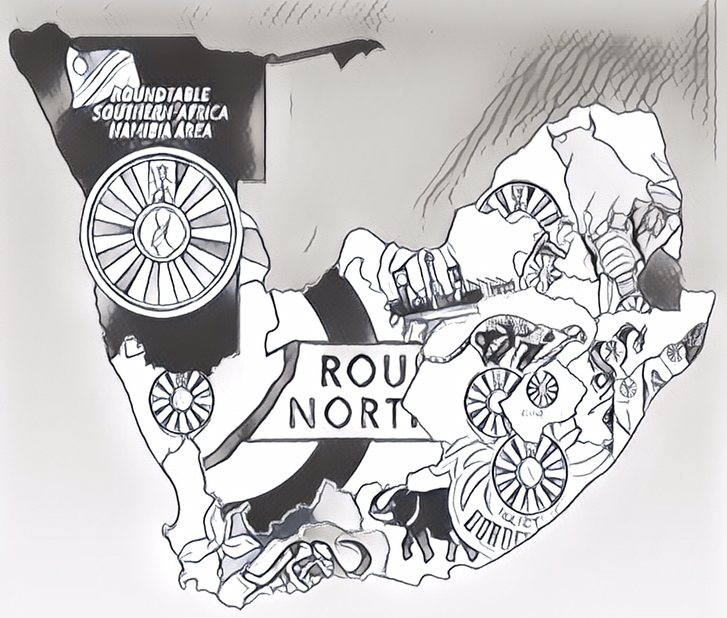 In November 1950, a second Round Table was established in Durban and about that time David Smith contributed an article on Round Table to a Rotary Publication. This made a great impression, and Rotary throughout South Africa gave full support from that time. Table No.3 was inaugurated in Johannesburg, in January 1951, and in that year an Association of Round Tables in South Africa was established. The first National Conference of the Association was held in East London in 1951 and from that time extension was rapid and spectacular – eleven new Tables in 1953 and fourteen in 1955, including two in what was then South West Africa (Namibia). Association and International Association that is explained in the following pages was developed. Following the independence of South West Africa in 1990 and the change of name of the newly independent country to Namibia, the Tablers of Namibia decided to remain within the existing Association. During 1994 Lesotho officially became part of the Association, with the re-chartering of a Table in Maseru (They had previously been part of ARTCA – Association of Round Tables in Central Africa). During 2002 Swaziland officially became part of the Association.